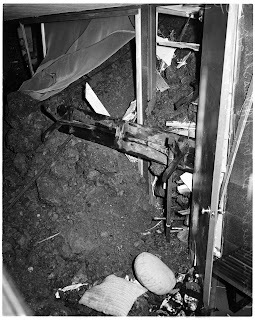 Heavy rains on the ides of March, 1952 resulted in a major and rather disastrous life-event for photographer Julius Shulman, his family and his beloved home at 7875 Woodrow Wilson Drive in the Hollywood Hills. He had met architect Raphael Soriano March 5, 1936, the same fateful day he met Richard Neutra, befriended him and in 1947 chose him to design his home and photography studio which has since become City of Los Angeles Historical Cultural Monument No. 325. (See my related post at http://socalarchhistory.blogspot.com/2010/06/julius-shulman-chronicles-1936.html). Shulman house under construction circa May 1949 with daughter Judy (McKee) waving in the background. Julius Shulman photo from "Julius Shulman: The Building of My Home and Studio", Nazraeli Press, 2009. (From my collection). Construction began on the house in May 1949. 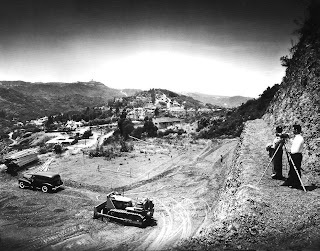 From the above photo it can be seen how heavy construction equipment including this bulldozer was needed to carve out a building pad from this steep, two acre parcel in Laurel Canyon. Shulman, wife Emma and four-year old daughter Judy moved into their steel-framed dream home on March 5, 1950, fourteen years to the day after the official beginning of his professional architectural photography career. 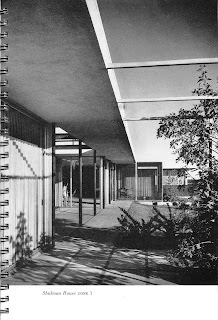 (See my related post at http://socalarchhistory.blogspot.com/2009/12/julius-shulman-residence-7875-woodrw.html). First publication of the Shulman Residence in "A Guide to Contemporary Architecture in Southern California", edited by Frank Harris and Weston Bonenberger, designed by Alvin Lustig, 1951. (From my collection). The above photo of the house was taken shortly after moving in circa 1951. Note the landscaping just beginning to become established. Daughter Judy (McKee) can be seen looking out the sliding glass door. The Shulman's felt privileged to live in their Soriano home as Shulman states in his autobiography Julius Shulman: Architecture and Its Photography, "An unexpected bonus was thrust into our lives: Soriano was the foremost pioneer in designing steel-framed structures in his world of architecture. How fortunate for us, for during successive decades, seismic activity left us untouched." 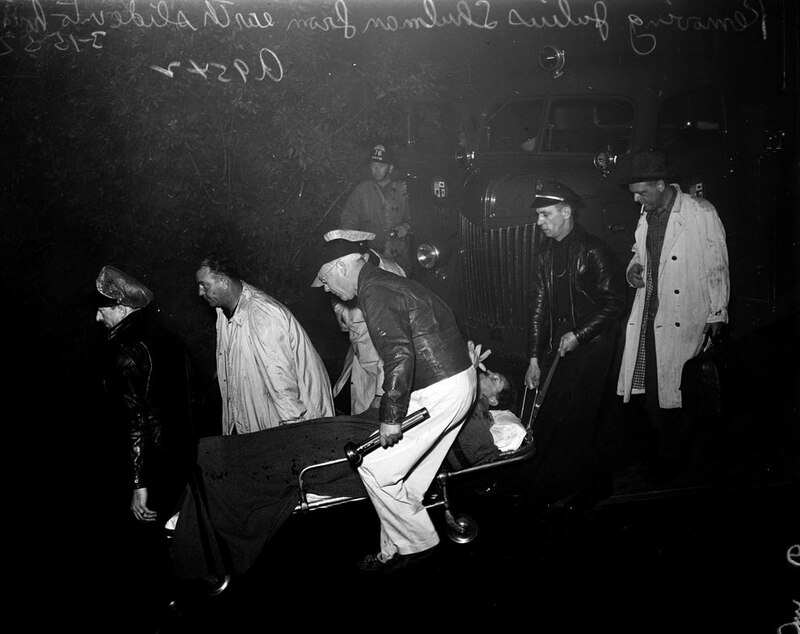 Julius Shulman being taken to the hospital on a stretcher with a broken leg after a landslide occurred in the heavy rains of March 15, 1952. A torrential rainstorm on March 15, 1952 created massive runoff from the slope behind the Shulman home which overwhelmed the newly-planted landscaping and brought down tons of mud, boulders and debris crashing into the garage and rear of the house. Shulman's valiant attempt to shore things up to keep the slide from entering the house resulted in a broken leg and a wet ambulance trip to the hospital. His log book indicates he was out of commission for close to five weeks until the leg had healed well enough to get back to work. At the time Shulman was averaging about one-and-a-half assignments per day so he took quite a hit to the pocketbook as well. 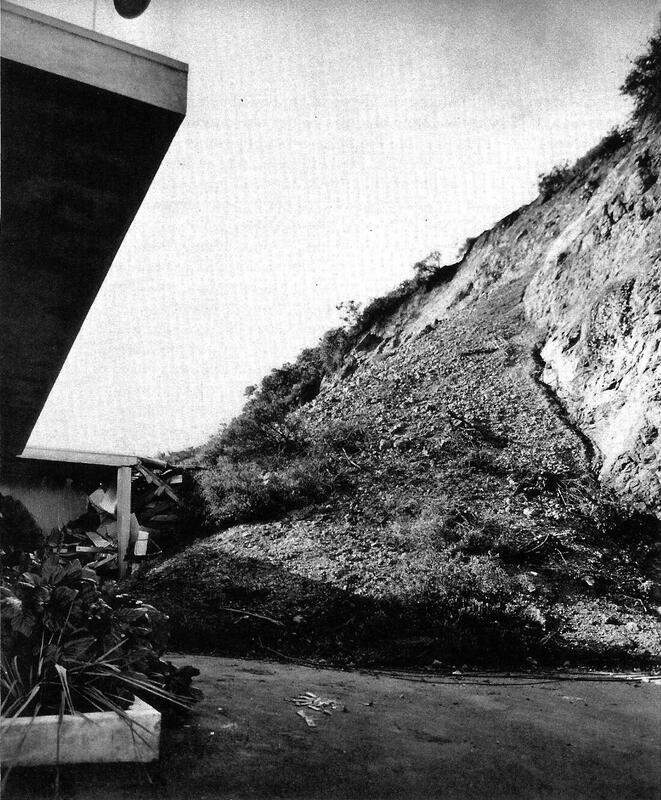 Landslide damage resulting from the heavy rains of March 15, 1952. Julius Shulman photo from "Environment and Design in Housing" by Lois Davidson Gottlieb, Julius Shulman, Photography Consultant. (From my collection). Shulman quickly recovered from his broken leg, repaired the house and attacked the hillside with a vengeance building retaining walls out of stacked concrete. He then planted countless varieties of vegetation that have long since fully matured as seen in the photo below. 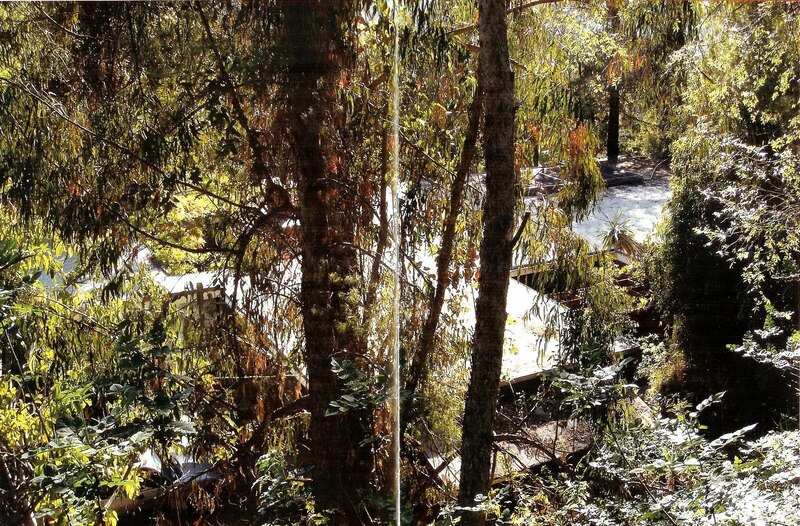 Over the last 58 years the grounds have grown into a forest of redwood, eucalyptus, jade, and agave, cut by trails that lead to the property’s edge. 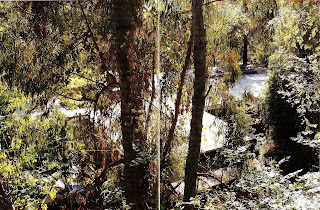 Shulman House from the hillside above. From "Julius Shulman Does His Own House" by Julius Shulman and David Tseklenis, Nazraeli Press, 2008. (From my collection). In a December 29, 1978 letter to Soriano from his autobiography Shulman writes, "Our home seems to accelerate in spirit and excitement as the years pass by. We finally have the living area especially, furnished in a most friendly and enveloping manner. The garden is even more exciting for Olga (Shulman's second wife) has transformed it into a flowery retreat. The above added to the density of our jungle of trees makes this home in my estimation the most complete in every respect. Of course, that is particularly so because we use it twenty-four hours a day. We are home at least four to six days each week so you can imagine how indebted we are to you for having made it possible; a rare feat for an architect. I say that because with the passing years I truthfully have seen very few complete homes. So much is done for architectural trickery or the decoration is an obvious attempt to gild or to impress people and too often the gardens are manicured and stiff, formal statements." One can hardly fault Julius for creating his jungle. 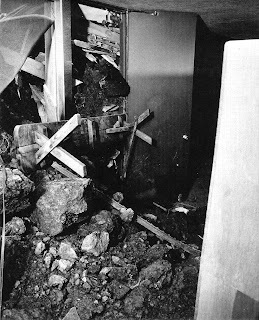 He was bound and determined to not have a repeat of the scary events of March 15, 1952. He also just loved his garden and never tired of proudly showing it off to each and every visitor to his studio and home.